If you are looking for a copier company in Scottsdale, look no further than Arizona Copiers. Scottsdale Copiers helps keep your organization’s staff working at their maximum capacity and productivity. With a few touch-screen commands, you have the power of scanning, saving, storing and retrieving documents quickly. It can be overwhelming to select a new copy machine. Let our experienced product specialists help you find the best copy machine for your business needs. Our copier staff has experience with installation and maintenance too. Do you have staff that will need training on how to use the new copy machine? We can arrange for that too, to make sure your business gets off to the right start. The image quality of our Sharp, Konica Minolta and Hewlett Packard copy machines is unsurpassed. We have a long history of outstanding products. Your business will love these workhorse copy machines. Your employees will be able to count on high-performance and durability 24-7, and access to repair and maintenance services on your schedule. Scottsdale Copiers understands your reputation is critical to your long-term success. Our digital copier and all-in-one machines provide a winning advantage to your home-based business or small business office. Let our customer service specialists help you design a copy solution to fit your needs. Is reliability important to your small business? Our customer service is top-notch and our products are dependable copy machines with the convenience of portability and reliability. 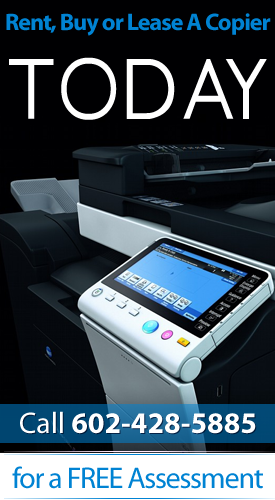 Our all-in-one copy machines offer affordability with features like touch-screen printing apps, fax, color copies, brochures and scanning. Scottsdale Copiers is a leader in digital imaging solutions in all industries, including industrial, commercial, consumer-based and business-to-business sales. We have satisfied customers worldwide. We are a leader in serving small businesses in Scottsdale. Our equipment minimizes interruptions and minimizes cost. We offer leasing options and rental options that fit your small business budget. We are the best copier company in Scottsdale. Use one machine for phoning, faxing, copying, storing and retrieving. We have copy machines that allow you and your network of clients to store and retrieve data on the cloud. This saves you information technology, networking and data plan expenses. Ditch your expensive plan to purchase hardware, software and information technology support for basic business needs. Use us for an excellent experience. We have been a copier company that small businesses in Scottsdale have relied on for years. Our consultants will design a plan to run your business more efficiently, transfer your electronic documents more securely, and produce higher quality copies, brochures and training materials than you thought possible. Experience what it’s like to use built in apps and document management software.